I know of no other trade except perhaps a good all-round mechanic who requires so many tools in order to undertake their work. 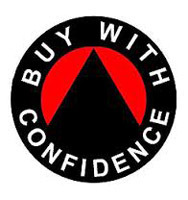 A brief look at online suppliers or trade catalogues will reinforce this statement. However, there are tools and then there are quality tools that to those in the trade hold a certain beauty. You can feel the quality and using good well-made hand and power tools is reflected in the overall quality of a finished project or article being made. Of course, for those who have no desire or need to undertake such tasks and who may only use a power drill for instance maybe twice a year, there is no need to invest in high end expensive tools and equipment. But for those of us who day in day out rely on precision and performance there can be no compromise. I still use some of the hand tools that as an apprentice was instructed to buy namely a few chisels and planes along with hand braces and hand saws. My chisels some of which have now been discarded as the iron has been ground and sharpened so many times as to render the chisel to short are one of those essential hand tools that I was told to get. The company where I served my time used to deduct £1 a week from my wages for tools, given that my take home pay was the princely sum of £12 the £1 deduction was noticed. Once or perhaps twice a year the foreman would then hand over a selection of tools that the company had purchased for the apprentices. It was a system that worked well, and I guess the buying power of the company ensured a generous discount therefore we built up over the course of an apprenticeship, in my case 5years, a well-stocked tool chest. The tool chest was made during the first year of an apprenticeship from Mahogany would you believe! And all the joints were dovetailed including the insert trays. This became your pride and joy in the work place and the tools that filled it your passport to earning a living. This was back in 1978 so portable power tools which were just showing up in the boat yard were for the men not the boys. I still have my tool chest. The insistence on quality and well looked after tools could also be seen when on Friday afternoon an hour or so before clocking off nearly all the joiners and boatbuilders turned to their tools and sharpened them ready for the following week along with any minor maintenance issues perhaps adjustments to plane irons or the sorting of drill bits etc. The company didn’t seem to mind this down time perhaps it had been negotiated I don’t know but I wonder if it’s a practice that is still going on in industry. It’s a habit which not necessarily practiced on a Friday I still undertake as a specific task. I have seen a revolution in portable power tools since my first power drill in the 1980s, routers especially can now undertake tasks that were not possible back then and skill saws that run on tracks make light work of sheet materials that need to be cut. The tools of my trade and the tools that I own are an intrinsic part of being a carpenter. The saying that a bad tradesman always blames his tools may be true, but a good tradesman only uses good quality tools. 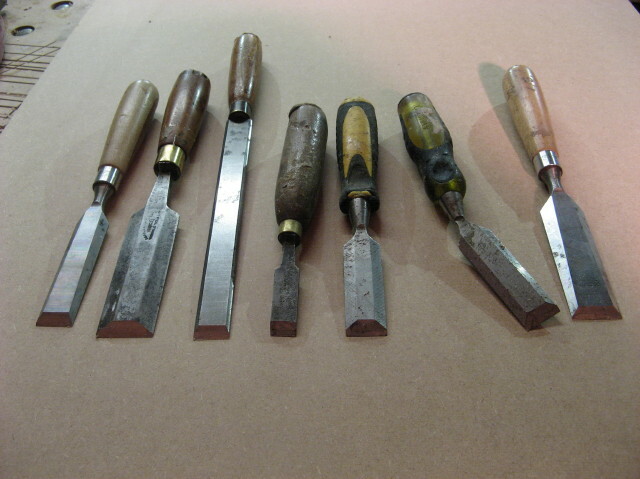 As you can see the chisels shown at the beginning of this article are well worn, these are my everyday chisels that I carry around from job to job and form a small part of my overall mobile tool kit. The second from the right was deliberately bent as I needed to get into an awkward corner whilst fitting spindles and handrail. There are generally three types of chisel available from most tool outlets that I use. The Bevelled edge chisel which is bevelled along both edges, this is used for general light joinery the advantage of having the bevels is that it can be used to undercut housings in mortices and dovetail work. The Firmer which is becoming increasingly harder to find has a stout blade without the bevels on each side and can be struck smartly with a mallet, I use this for more demanding carpentry. The Paring chisel which is becoming even harder to find has a longer blade usually around 7-9” depending on the width of the blade but older ones were up to 12” in length these are used to trim long grooves or as the name indicates to par wood. This is the chisel I use most of all and because of its extra length you have more control over it. The Mortice chisel which as the name suggests is generally used for cutting mortices. Firmer Gouge used to cut hollow or curved shoulders. Swan Neck used to cut deep blind recesses. All Steel chisels, these are made from one piece of steel with no wooden handle and be struck hard with a hammer so are ideal for heavy site carpentry. I am always on the lookout for old chisels with reasonable stock, old would be pre 1970. The steel used then to manufacture them is superior to the steel used nowadays, so they keep their edge longer. If you have any old chisel lying around in an old tool box in the garage – then I’m your man, give me a ring or use the contact page and I will be interested in buying them. When it comes to sharpening, I try to maintain a bevel of 25 degrees, many carpenters then go on to hone the cutting edge to 30 degrees, but I was taught to stop at 25. 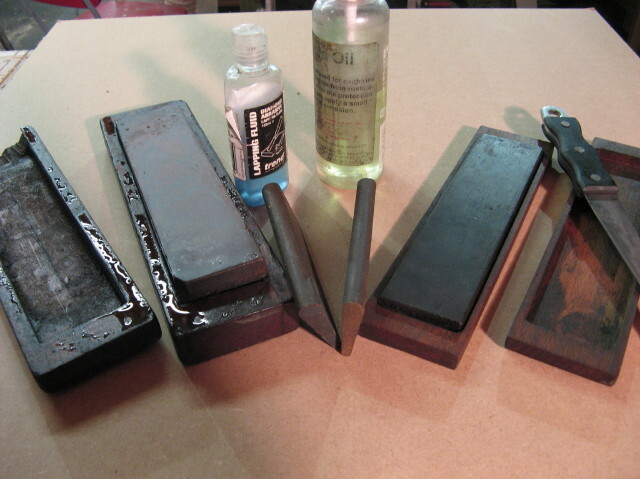 There are plenty of videos on youtube and other platforms that show you how to grind and sharpen chisels and I am sure the world really doesn’t need another one, so look there for advice on sharpening. My only advice would be to use a fine good quality oil for the final honing on a good quality, preferably natural oil stone.